That is something Carla Guedo (BSP, 2005), owner of the Medicine Shoppe Pharmacy in Place Riel, learned when she commissioned a team of bright young business students to draft a marketing plan for her. Specifically, the students were a part of professor Barb Phillips’ Integrative Marketing Communications class, a fourth-year course in the Edwards School of Business. Student groups work collaboratively on marketing and advertising plans for a client Phillips chooses— typically a small business or not-for-profit in the community. The students present their thorough plans to the client, who picks the best one—that is, the one the client feels represents their business the best. The plan is then adopted and executed by the client’s business, giving students a taste of the marketing world before they have their degrees in hand. The project is a staple of Phillips’ class, and one she has been doing for 20 years, with past clients including the Saskatoon Symphony Orchestra, Tourism Saskatoon and Wanuskewin Heritage Park. With all that in mind, Guedo approached Phillips about the project last fall, providing her with an overview of the business to “really understand what we were looking for,” she said. Phillips then relayed this information to her students, who presented their ideas to Guedo in December. 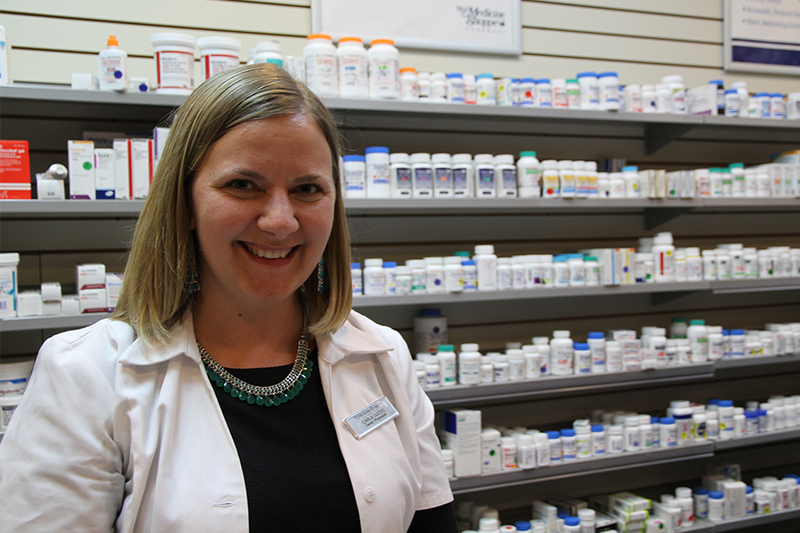 While the pharmacy is certainly open to the public, “it’s mostly students who use it,” said Guedo. She is given some resources for local marketing and advertising, as well as pre-made branded materials, but these pieces are typically targeted towards seniors—not a common demographic on a university campus. To catch the eye of that elusive target audience, the plan included advertisements that “look like glossy fashion ads,” said Phillips. Rather than hiring models, the group chose to use students in the ads—addressing common health concerns such as headaches, cold sores and chapped lips—something else that really appealed to Guedo. The ads also contain the tagline “On Campus, Just Like You,” which serves as a gentle reminder that there is a pharmacy within reach.